Description: Brand spankin new! Date Approxamate. Description: Date Approxamate. Taken from McHenry St. 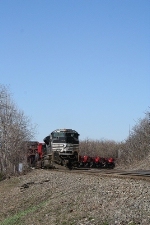 Description: 20T with a SD70M-2 leading the way. Description: Norfolk Southern extra 2687 east at Cleona with an eclectic lash-up. Title: WB Manifest Train 19G @ 1003 hrs. Description: 19G heads toward the Delaware River crossing @ 0952 HRS. Description: Splotch-boy SD70 leads a rare C39-8 west on 1 around the curve alongside a coal drag parked in Stowe Yard near Pottstown on a sunny afternoon. Description: SD70M-2 blows eastbound by the signal at Royersford with NS general freight 38G. Description: While another eastbound waits in the center siding for pushers, an eastbound coal train, powered by some of the newest models from GE and EMD, rockets past the old coaling tower at Farm, West Virginia. Description: SD70M-2 2687 pulls NS mixed freight 39G westbound off the Trenton Line Delair Branch at Mantua in Philadelphia alongside the nec. Description: NS 33K on the siding after working Manville. Description: 18th Ave., 0800 hours. Description: Roster of NS 347's leader today. Description: Eastbound on track one with a pair of EMDs at sunrise. Description: Parked at the south end of Enola yard.